What Happens in Vegas… Should be Shared! Every January, SAP hosts their annual Sales Kick-Off event, called FKOM. 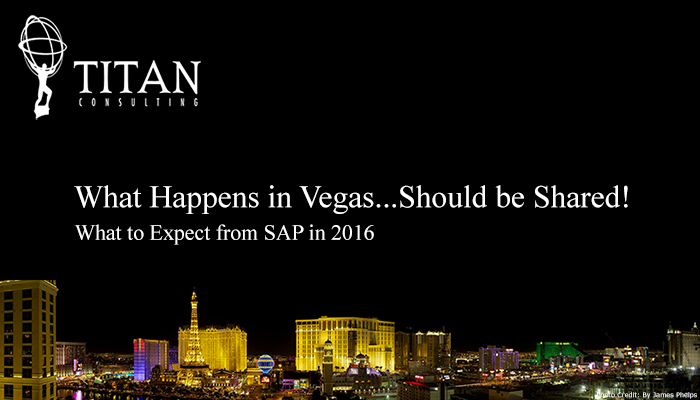 This year, about 6,000 SAP employees and partners descended upon Las Vegas for two days to learn how SAP will address their 2016 go-to-market strategy. Granted there is a lot of Kool-Aid served and consumed at sales kick-off events, but this year, there was a little extra spike in the punch! Bill McDermott, CEO and member of the SAP Executive Board, gave an inspiring summary of the 2015 results and paved a promising roadmap for years to come. Look at SAP’s 2015 results; they killed it against their targets and competition such as Oracle, Salesforce, and Workday. • 103% increase in New Cloud Bookings. • 81% increase in Cloud Subscription and Support Revenue. • 2700 S/4 HANA deals, doubling the adoption rate over the last quarter. • Increased earnings guidance for 2016 and 2017. These are some amazing results for a company labeled a dinosaur and irrelevant a few years ago. What does this mean to you, our customers? • HANA and S/4HANA are for real, and enterprise adoption is unmistakable. • SAP’s cloud solutions are competitive in CRM and HCM. • Business Network Solutions for Ariba, Concur, and Fieldglass. We believe that SAP’s strategy around HANA as the core for Digital Transformation is sound. That does not mean that everyone needs to migrate today. We recommend that you begin the conversation and planning on how to migrate to this platform. SAP’s investment in their Cloud solutions is paying off. SuccessFactors and Cloud for Customer are competing head-to-head and winning deals from rivals — Workday and Salesforce. A key advantage that we see and confirmed at the event was integration to the enterprise on a domestic and international level. As these cloud solutions are subscription based for a 36-month contract, renewals are critical in this area. For existing customers, we see a high renewal rate and expect this trend to continue as SAP a) continues to invest in their cloud platforms and, b) customers avoid migrating from cloud platforms due to additional time, cost and effort. In the connected economy, SAP presents an attractive set of solutions to streamline Buyer/Supplier Networks, Business Travel and Spending and the Contingent Workforce. SAP Ariba, the backbone for buyer/supplier networks is processing over a billion dollars of transactions. As digitization and convergence of technologies increases and become easier to deploy, the Ariba solutions will help IT organizations support their business partners connect with the right suppliers and buyers. The 2014, $8.3 billion acquisition of Concur has provided multiple benefits to SAP. The primary benefit is the maturity of the Concur cloudbased solution, and their ability to network with travel providers like airlines, hotels, Uber and others to provide the Perfect Trip. An additional benefit is that approximately 80% of Concurs customers are not SAP customers providing access to new opportunities for SAP’s Enterprise Suite including HANA and S/4HANA. SAP Fieldglass, a Vendor Management System (VMS) is not one of the better-known applications in the SAP suite. However, this cloud-based app that manages contingent workforce and service vendors is poised to support the growing trend towards a large temporary workforce. In 2015, Fieldglass helped place over 1 million jobs for their customers. We will pen a few more articles on how SAP’s strategy may align with yours. However, after spending some valuable time at FKOM, we are as excited and optimistic about SAP’s future and how their applications will provide the digital transformation led by HANA is underway. If you are interested in finding out more about Titan and how our Advisory Services can pave the way for your Road to HANA, contact Warren Norris, warren@titanconsulting.net, or 972.679.5183; or contact your Titan Consulting Director. You can also see additional information on our Advisory Services page.